If the fuel rods spill onto the ground, disaster will ensue and force Tokyo and Yokohama to close, creating a gigantic evacuation zone. All scientists I have talked with say that if the structure collapses we will be in a situation well beyond where science has ever gone. The destiny of Japan will be changed and the disaster will certainly compromise the security of neighboring countries and the rest of the world in terms of health, migration and geopolitics. The wall of the south side is falling apart at reactor 4. Reactor 4 is in the most serious situation. It is assumed that if another aftershock hits it to drop the spent fuel pool hung in the building, the entire area in eastern Japan would be too contaminated to be inhabitable. 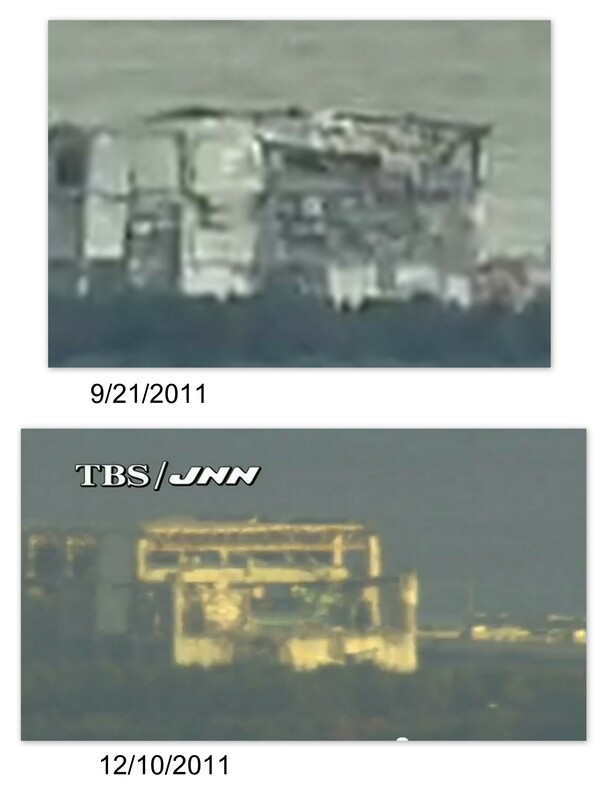 On 12/2/2011 (JST), something like “fire” was observed beside reactor 4. Since then, a strong light has been set toward Fukuichi camera as if it was hiding something by white out. 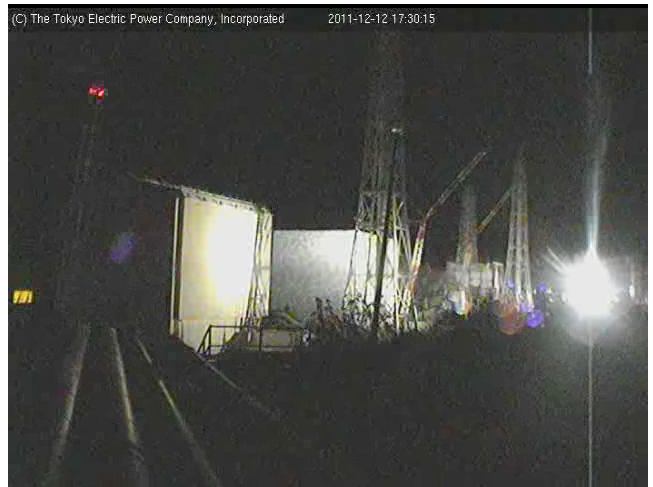 However, thanks to JNN Fukushima live camera, it was confirmed that the wall of reactor 4 was lost on the south side. At least since 12/5/2011, the wall is missing. Thank you again for you ongoing and outstanding coverage of this important story. If one turns on the TV news, they are speaking of presidental candidates, what one fool said about another…..total obfuscation. The current Japanese earthquakes are not mentioned, either, too close to the truth. Karma, World, karma…for America dropping two dumps on ya a half century ago.